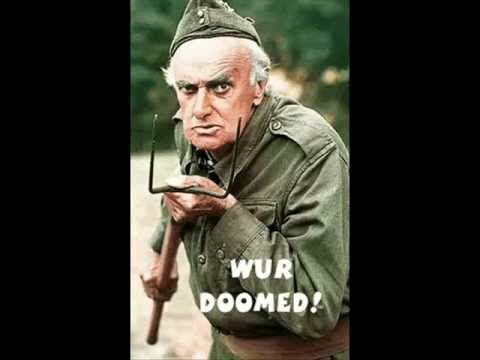 We're all doomed, I tell ye! Doomed. Brits may already be hearing the title of today's episode in a Scots accent. Spike feels pretty much that way in this episode. Well, it's another apocalypse anyway - not even May. What is the world coming to? 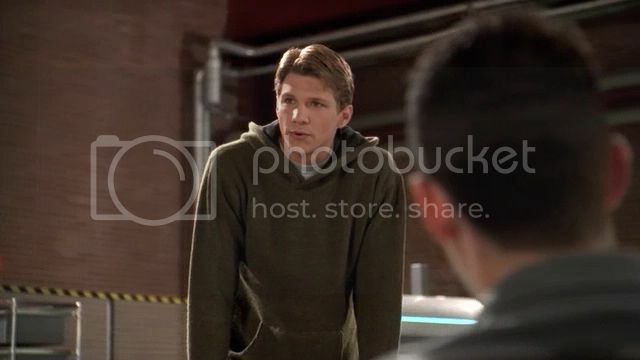 It looks like Buffy's burgeoning relationship with Riley is doomed - they each discovered a few too many secrets were being withheld during Hush, and trust is, one might say, an issue. Turns out Riley hasn't even heard of the Slayer, though he's impressed by Buffy's moves. Then there's an earthquake, which gets Riley all excited, but pisses off Spike, because water drips on him. But Xander is also pissed off and wants Spike to pull his weight a bit more - mend the burst pipe, do some washing. Bad idea, Xander. 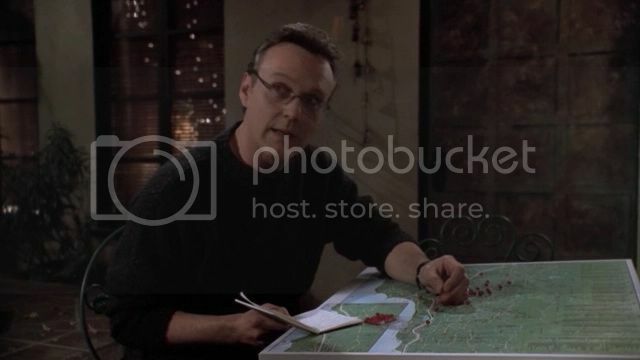 Buffy's worried about the latest quake, but Giles is blasé. It's SoCal. Earthquakes are what they do. Will nobody take her seriously? Forrest brings Riley up to speed about The Slayer - a myth, man. Unlike the demon who attacks him. Who is just an animal, worked up by the earthquake. Frat boys are worked up enough to have a party, their go-to response to any natural phenomenon. For one of them it doesn't end well. Yes, Willow was sad already because Percy was rude about her, and that was even before she found a corpse in the bed. Spike is also distressed. His clothes shrank and he had to wear some of Xander's. Xander resents the theft but finds the result hilarious. He may have a point. Willow is obsessed. Percy called her a nerd. Oh, and there was this dead guy. And even Xander is sympathetic. But Giles discovers it is the end of the world. Again. Buffy was right and he's sorry. His contrition dwarfs the impending apocalypse. Buffy meets Riley in the workplace. She's really not happy. These workplace romances never end well. Their relationship is doomed. So two teams have briefings and ride on out. The Initiative. 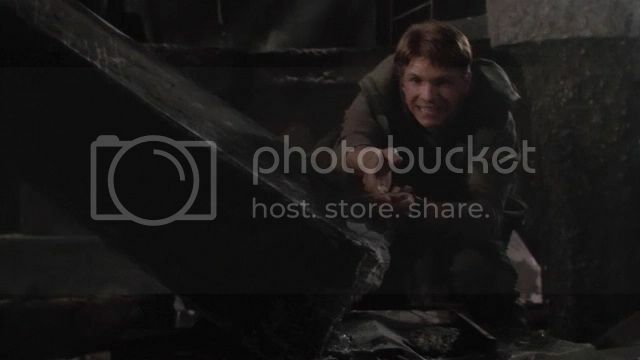 And the Scoobies, who have much better research on their side. 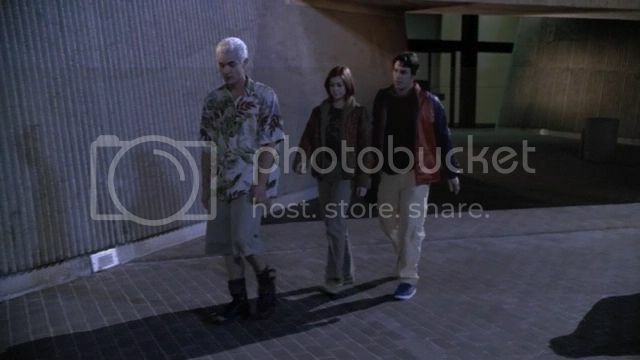 But when Xander and Willow drop by his place to pick up supplies, they find a suicidal vampire. 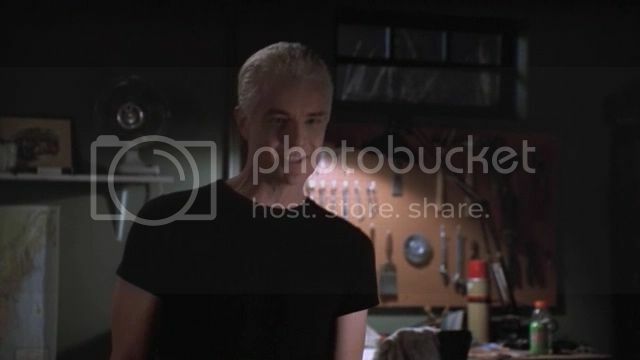 Spike can only be cheered up by the promise of an apocalypse, and even Xander soothes him, when his offer to help with the staking is turned down by Willow. And Riley and Buffy have another conversation about just how doomed their relationship is. It goes on a bit, but Buffy is adamant. 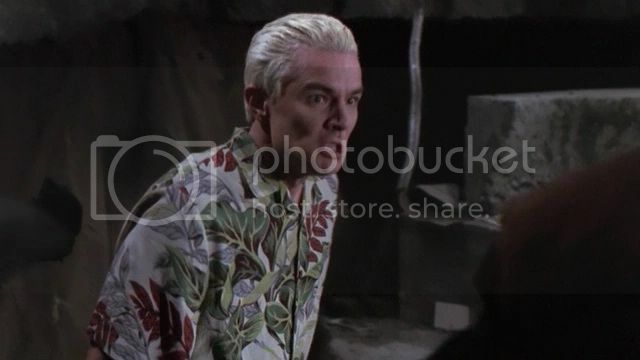 Spike is still unhappy, but while waiting for an apocalypse he can at least annoy a couple of Scoobies. Not much, but he'll take the crumbs he can get. 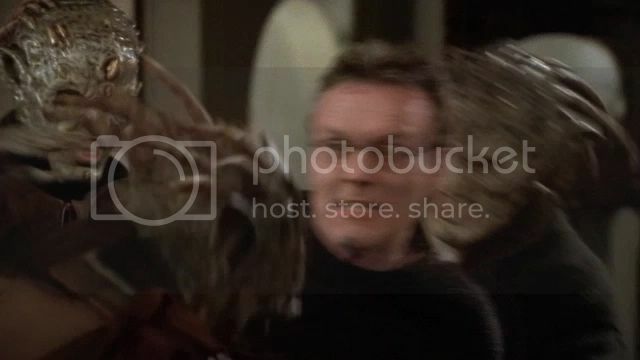 Meanwhile, Giles finds the missing McGuffin, and is knocked on the head by thieving demons. An ordinary day for him, then. And it's off to the Hellmouth, now of the charred variety. And inside's not much more glamorous. 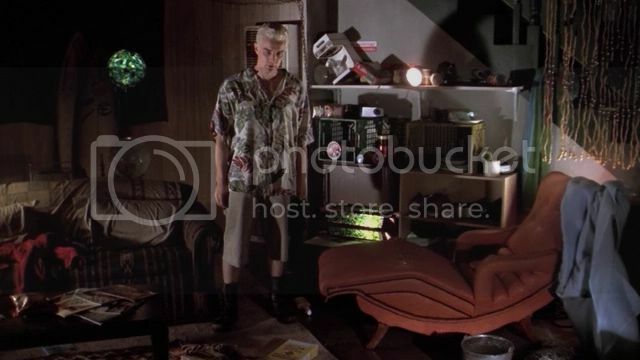 But look at Spike's legs! Somehow, on the walk, he found a pair of jeans. Which nobody notices. 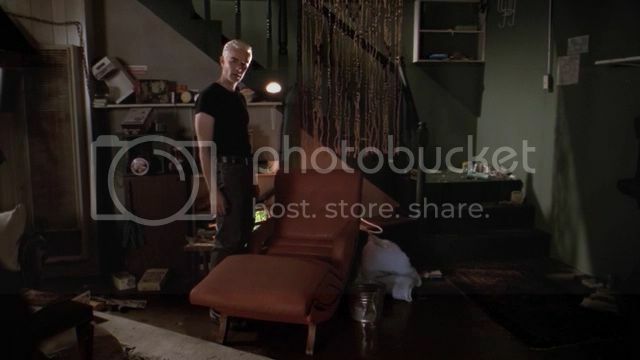 Spike is mainly there to annoy Buffy, but when they get to the demons he makes an exciting discovery. He can hit them without his brain exploding. And suddenly his unlife has meaning again. It's a pity he does almost exactly the wrong thing with his new Special Power, but hos was he to know they had to keep the demons away from the hellhole? Buffy is seriously unimpressed. And the creature is pulled out of the Black Hole of Doom. Hey, maybe these crazy kids can make a go of it after all? In the aftermath, Riley's the depressed one. His cover is blown, a mere pack of civilians bested him, and what point does he have in living? Pretty much the way Spike was feeling earlier. Buffy, however, is able to persuade him that there are worthwhile things left in his world. But Spike is all cheerful and stuff. His world is a much better place. Why don't they go kill beasties? For the sake of puppies and Christmas? Lots of incidental plot and exposition in this episode, which follows directly on from Hush. After one of the all-time greats of the entire show, the next episode was likely to be a bit of a comedown, and Spike's costume as the centre of the comedy is perhaps a trifle feeble. He manages to carry it off, however, with a set of mercurial mood-changes and expressions and a punch-up to make his day. Riley and Buffy's relationship moves on a little more, and we see the Initiative in operation. 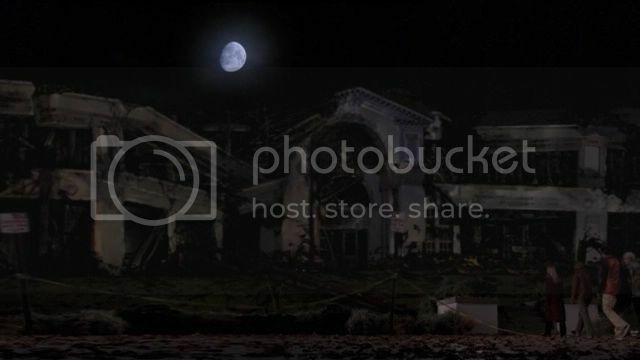 Pity the well-funded Government Team isn't actually as good at it as the amateurs - but we see how assumptions that all paranormals are mere animals gets in their way. A passing reference to Othering, perhaps? We will see what that leads to when oz returns. We see a lot of tropes either already familiar or soon to be. 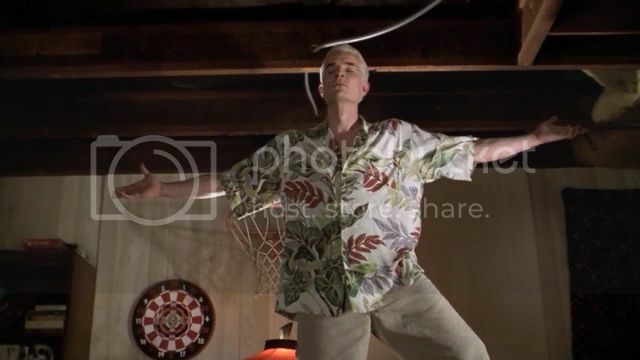 Giles is knocked on the head, Willow is called a nerd, Spike is very efficient at unsettling the Scoobies. The Initiative are all crisp army language and gadgets but not as much use as a group who bother to do research in books (Humanities?) rather than laboratories. (Scientists?) Certainly we are not encouraged to espouse the path of science as judgement-free. The title, as we are fairly accustomed to by now, applies in multiple ways - to relationships, the world, hopes for the future, Willow's party-girl plans - and the Initiative, though it will take us some time to realise that. The first cracks are showing, however, in Team Scooby and Team Initiative. James Marsters nearly lost his job over the change in legwear. Whose side are you on? Are you glad to see Buffy and Riley talk out their issues or bored? Why did Percy survive Graduation? 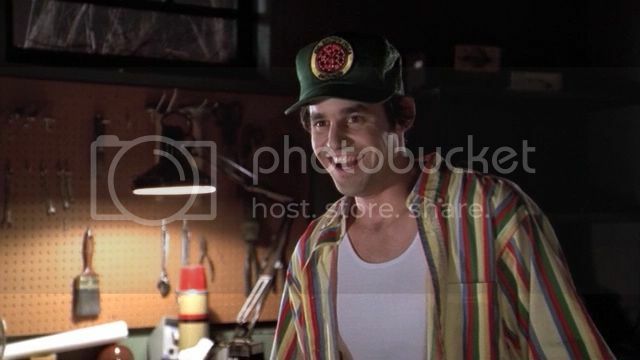 Does Xander look as silly as Spike in his Pizza delivery outfit or worse? What do you think of the episode? Humdrum MOTW, essential arc development, or hilarious gem? Comments are eagerly sought on these or any other questions. All caps courtesy of Screencapped. My apologies for the delay in posting this episode - I've been both very busy and not very well. I hope we're back on track now. Please do leave comments! Hilarious gem! 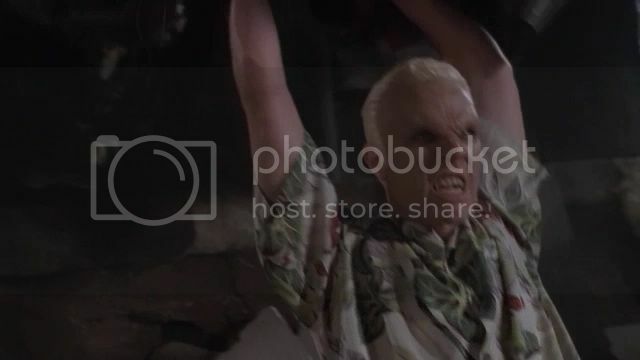 I love Spike's attempted suicide, Willow and Xander's reaction to it, and how he turns on them almost at once! He's definitely the star of this episode, while Buffy and Riley are a snore-fest. There are some good moments in this episode. No worries. RL always takes precedence, especially when health is involved. I think this episode advanced the plot, made us giggle at Spike, and was an okay follow up to Hush. Not a favorite, but fun in places. I hope you're feeling better now, no apologies! I must ask those who know these things: why is Buffy Capricorn + Aquarius if her birthday is on January 19th? Should she be just Capricorn? Also, what exactly does it mean: "cusp"? It's just a way of saying her b-day is near the end of January. It's like saying "I'm 18, almost 19!" Yeah, I get that. I was wondering what does that mean in purely astrological terms. Out of curiosity. Maybe someone here understands that sort of things! I don't like this episode that much. It could just be that it seems such a let down after Hush. Spike wanting Willow and Xander to reassure him that they're not just saying it when they talk about the apocalypse is a great moment, though. There probably is some sort of lesson in here about science without ethics being evil (which is true, though it's not the science but the people doing it that are to blame, of course).